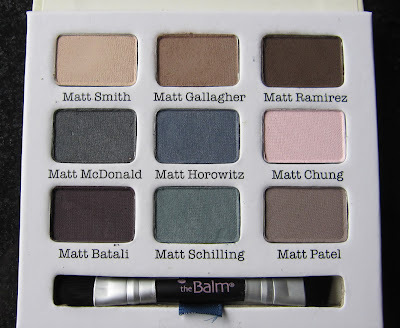 I already did a tutorial using this palette here at The Balm : Meet Matt(e)! - a crazy look nonetheless that i would never ever wear outside my house! - but i haven't actually talked about the actual eyeshadows themselves. 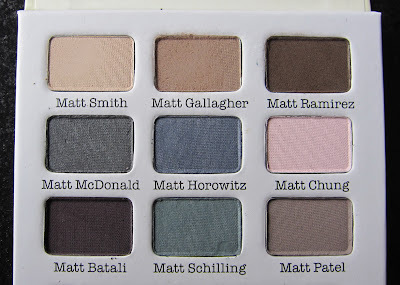 All the colours are, of course, matte. My first impression of the colours? I don't think i can ever work with Matt Chung. And Matt Patel will undoubtedly be the most versatile colour in the palette. The packaging is adorable. As are all the other The Balm products. 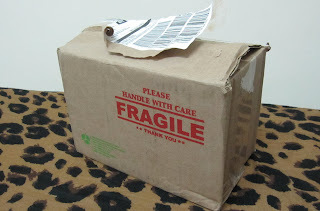 Some people hate the cardboard packaging and call it kitschy but i adore it. I even love the handsome face of the Matt at the front! I didn't love the shadows in the palette straightaway. I was sort of at a loss on what looks to create with the colours in this palette. But all it took was a few more tries and that's it, i'm hooked! Let me just clarify that my swatches below are not the best: i was going through a dry skin patch at the time this photo was taken from being coped up in air-conditioned hotel room for too long. The colours are pleasantly very pigmented, but that is to be expected with The Balm's eyeshadows, they have an amazing colour payoff. And people always say matte colours are harder to blend compared to shimmery ones, but i really think with this one, that shouldn't be something to worry about. The matte colours are creamy to work with and i find that they are easy to blend. Of course, like all palettes, there are some colours that you wouldn't love as much as the others. My least favourites are the two lightest colours, Matt Chung and Matt Smith. But then again i rarely use light colours for anything, i hardly highlight my browbones as well and even if i do i prefer to use a slightly shimmery colour. I personally feel like with the texture and colour of my skin, matte light colours would look pasty and chalky on me. My two most favourites for now are Matt McDonald and Matt Batali. Again, i'm too much of a smokey-eyed kind of girl so it's natural for me to pick those two colours as the best ones in this palette. And they are so easy to use: i would smudge a creamy eye pencil on all over my lid in a similar colour as the shadow and then with the shadow, apply on top of the liner and just do more and more smudges. You get instant wearable day-time smokey eyes! I haven't touched the brush like, at all. From its appearance, i don't find it will be much use, but anything that comes for free with a purchase, of courseee i'll keep it! If you're the kind of person who really needs touch ups throughout the day, then i can imagine you would fine the brush useful. I will definitely agree with this palette being extremely wearable for a day look, like for work or a meeting. You can spice things up by adding a fun colourful blue or green liner on top of the lighter colour on the lids for example. The palette retails for RM 99 and that price for eight great shadows (i'm excluding Matt Chung on this), how can you not want it? Of course, i should tell you that i am one of The Balm's biggest fans. I loveloveLOVE The Balm, it's probably my most favourite brand ever, and coupled with its affordability, i would definitely tell people to go for this product if they're in the tightening-purse mode yet are looking for amazing makeup products. 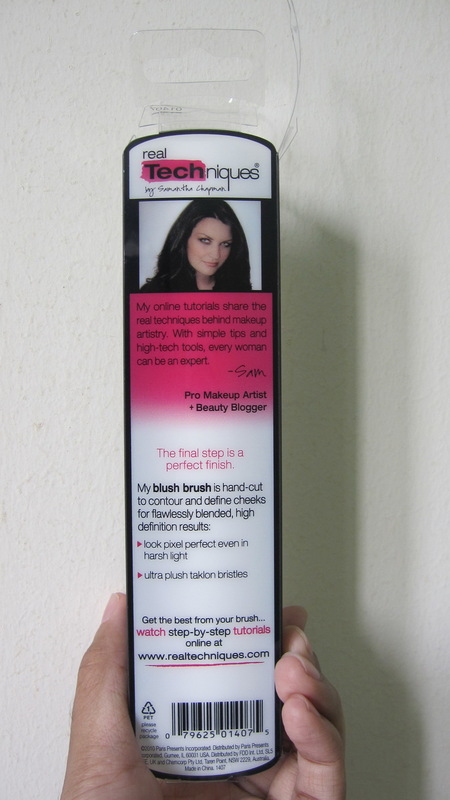 This palette is available at Sasa stores in Malaysia; go ahead get yours today! 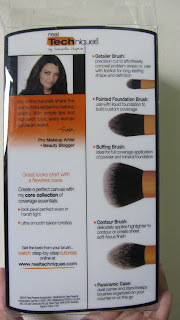 I am happy to tell you that the brushes have arrived and they are none other than the Real Techniques by Samantha Chapman brushes! I am super excited because i am a big, big, BIG fan of Samantha and Nicola of the pixiwoo duo. As do other fans of them, i've watched probably all of their videos. The absolutely amazing thing about this whole process is i ordered these on 5th of March, Monday and they arrived just THREE DAYS after! So on Thursday i was happily tearing apart the box that contained the brushes. It was my first time ordering from iHerb.com so i was understandably nervous, but i definitely commend iHerb.com for the fast delivery. I won't hesitate to order from them in the future for sure. I bought two single brushes and two sets: the stippling brush, the blush brush, the core collection and the travel essentials. I have not tested out this brush; as i said, i've been unwell for the past few weeks and i am currently experiencing some irritation in my right eye from allergy reaction, so these brushes are going nowhere near my face anytime soon. I tested them on my hands though, and the bristles are so incredibly soft. 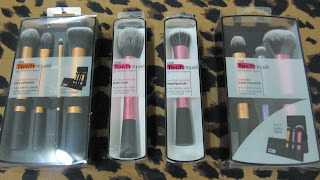 Just from looking and from the feeling of them on my hands, my favourite out of the bunch right now is the blush brush. It's relatively big but so so so soft and i love the rounded brush that tapers to a tip. But i love all the other brushes already too. The stippling brush was a lot smaller than i expected, but when i tried swirling it on my hands, i understand what people said about the bristles being sturdy enough to buff out foundation. I am really, really hoping i get really healthy again soon, because they look so luscious, all unused in my kit. A company called Paris Presents (from the US, from what i understood) approached Sam to create her own line of brushes. Amazingly Sam didn't have to fly to the US not even once to produce these fantastic brushes. But of course Sam was involved in every step of the way and i believed she put her heart and soul into creating the most perfect and best of all affordable brushes she could come up with. 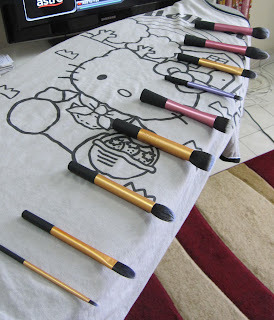 These brushes are colour-coded: the yellow ones are to create a flawless base; the purples are to enhance the eyes and the pink brushes are for perfecting the finish look. The bristles are taklon, which is synthetic, thus they're all cruelty-free. Their ferrules are made from aluminium and the brushes are all light. Each brush has its name stamped on it for easy reference, but i do believe most of her brushes are versatile. The great original thing about these brushes is some of them can stand upright on their base! 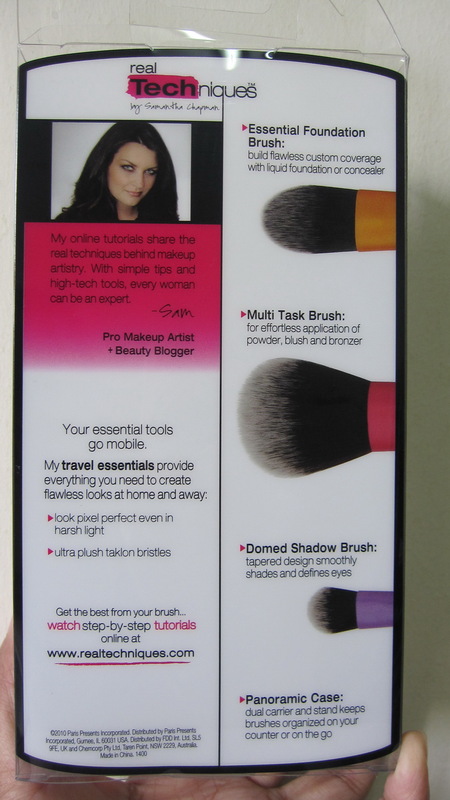 So you can do your makeup at your makeup counter and switch between brushes easier than usual. The brush sets come in panoramic brush cases, which can be folded into a standing position as well. I do like the cases but i really, really wish the cases can be zipped up or closed in some way or another. I don't like having my brushes exposed. But this is a small matter to me though. 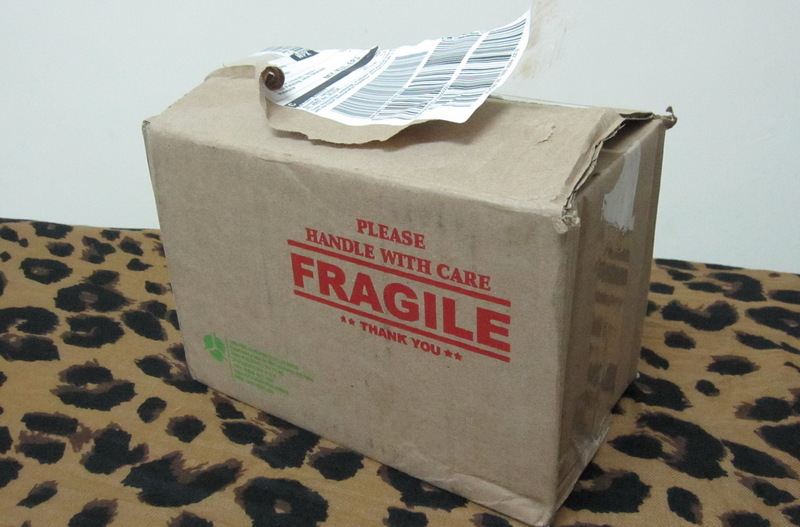 The brushes came in clear, see-through plastic boxes. At the back of these boxes, they explained which brush is which and gave a short description on the brushes' respective function. Besides the blush brush, i'm also looking forward to using the stippling brush, the buffing brush, the contour brush,and the multi task brush. I didn't bother purchasing the powder brush even though i don't have a proper powder brush in my kit, but i'm hoping the multi task brush will work wonderfully at this. I didn't get the kabuki brush for the same reason, but i absolutely regret not buying it anyway. More so because when i voiced this out to Shah, he went "Why didn't you just get it as well?" which is unheard of, my husband doesn't usually tell me to get extra brushes. I'm still unsure of how to use the smaller brushes, but i've read that the domed shadow brush is great at blending out concealers. The two foundation brushes are definitely itty-bitty for a foundation brush, but i'm sure i'll find uses for them. 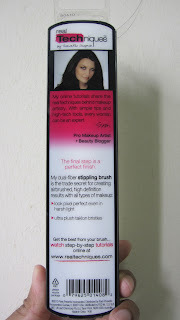 I might use the detailer brush as a lip brush more than for spot-concealing. 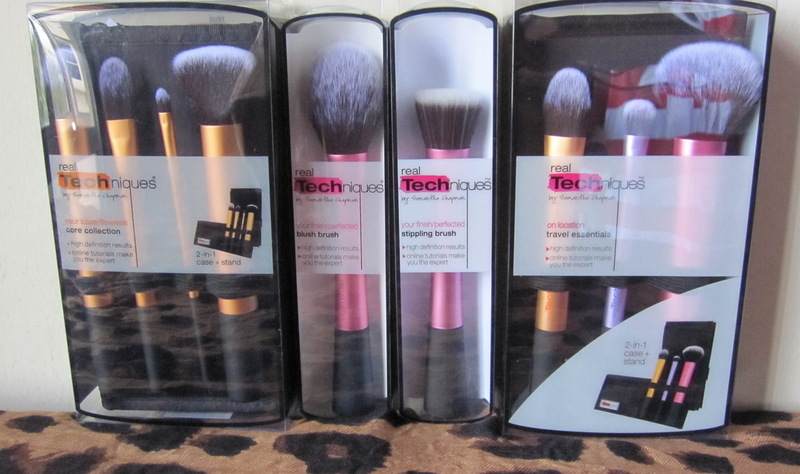 Hopefully i can come up with a proper review for each of these brushes in the near future. I mentioned that i found out these brushes are being sold locally after i ordered this online and before i received them. Which incidentally added to my nervousness. But after further researching infos of them online, i discovered that had i bought these exact brushes locally, i would've spent more than double what i did. Which is CRAZY. I spent about RM200 online for them, but the set brushes alone are being sold in Malaysia for RM135 EACH. So you can imagine how happy i am to have ordered them online. They're all clean now and in my kit. Until i review them!